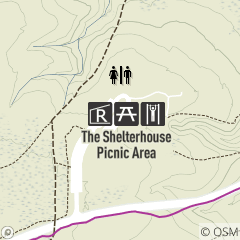 Shelterhouse Picnic Area is located just East of Sulphur Springs Dr. off Hawthorn Parkway. It offers a very large open sided Shelter(half of which is reservable), picnic tables and grills, a large field, horseshoes, swings, and a restroom facility. The area has access to many different trails including the Fitness Trail and Bridle Trail with parking for Horse Trailers in the Parking Lot.